Finding the best day care or school for your precious child can be a challenge. Especially if you are not as ready as your child is for the new adventure. I don’t know about you, but I am a “little bit” of a control freak and because I work in education, it’s even harder for me to let go and just do it! I believe that the purpose of schooling is creating a community that nurtures and inspires a love for learning, in a diverse caring student-centered environment where all children feel safe and confident, respected and heard, and where they can grow at their own pace. They should be taught to accept and respect differences and one another, and they should be challenged according to their individual needs and development. Learning comes with the child, not with the subject matter, that’s why knowing each student very well and establishing a personal connection with every single one of them is crucial. The entire school should be a place where people like to spend time. I like seeing children helping with simple chores, a pleasant atmosphere, and of course, bathrooms and lunchrooms in a good condition. On the walls, I prefer children’s work that is actually made by them, and that is displayed at their eye level. The awards and diplomas of the school don’t impress me that much. I make sure the place is childproof and that it has a good outside play area. Another aspect to look at is the proximity of busy roads, a source of great pollution. I strongly believe in the saying “There is no bad weather, only inappropriate clothing”. It is very important to me to find a place where children go outside every day for at least 1 hour. Don’t hesitate to ask all questions that come to your mind. What are the policy of the school, the teaching philosophy and the credentials of the teacher your child will have? Are the caregivers first-aid trained? How do they handle emergencies? Do they use time-outs or rewards? Is the learning play-based? Do students watch TV? Are they encouraged to be independent? What is the policy regarding sickness? What happens if a child needs help taking a nap? Is the food they serve healthy? Does the institution have a current license? It is easier for me keep track if I write down all my questions, before the visit. A good way to learn more about a school is to ask other parents about their experience. Online resources are another great way to find reviews and personal stories that can help you form an opinion and make a decision. Make sure the school has not been involved in any scandals and children have not been lost or badly hurt there. You might find a school that checks all the boxes but it just doesn’t feel right for you or one that doesn’t have half the things you are looking for (the less important stuff hopefully), but you and your child really like the teacher. I would say, listen to your heart. If I had to choose 3 most important aspects for my child’s preschool, those would be safety, a good teacher, outside play. 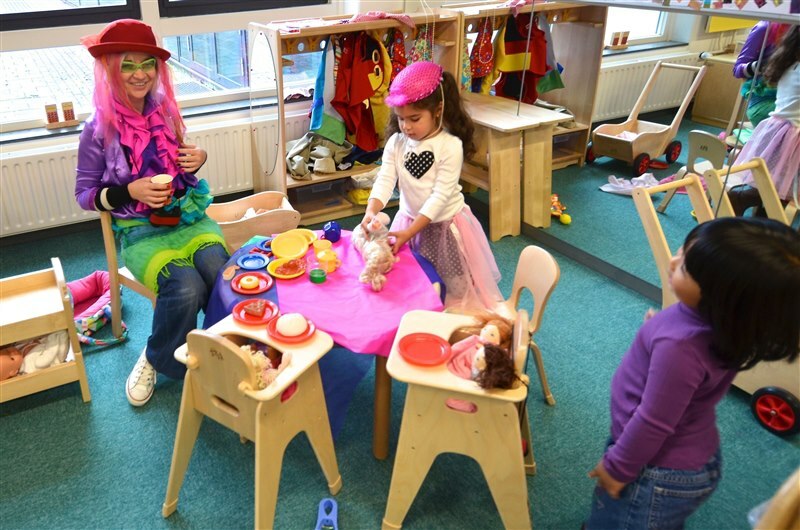 I am not torn between academics and play because I believe young children who are provided with rich play-based learning environment excel in all domains of development and learning. If my child is eager to go to school, if he looks forward to seeing his teacher and peers, that means he enjoys learning. At the end of the day, like every parent, I just want my little boy to be happy! *Note: The pictures in this post have been taken by Matthew Steuer, at The American School of The Hague (NL) where I have worked, with permission from parents. Thank you, Pam! I really appreciate you taking the time to comment! It means a lot to me! Thank you, Anna! I’m glad you like it! the school, and that they haven’t had any incidents. instructors to make sure we can feel safe at wherever we put him.